Be the first to share your favorite memory, photo or story of Trenton. This memorial page is dedicated for family, friends and future generations to celebrate the life of their loved one. 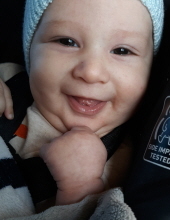 Trenton Logan Valles, beloved infant son of William Valles and Michaela Erin Hamilton, passed away Tuesday, November 13, 2018 at the tender age of 3months and 11 days. Trenton was born in St. Louis, MO on August 2, 2018. He will be greatly missed by his loving family which includes his parents, William Valles and Michaela Hamilton, of Rolla; three sisters, Meredith Hamilton, Melinda Valles and Angel Valles; grandparents, Scott and Angela Hamilton of Edgar Springs, MO, Marlene Ortiz of Grand Island, NE, and Francisco Valles of Denver, CO; great grandparents, Ruth Morgan and Shari Harris of Edgar Springs, Fred and Helen Hamilton of Clarksburg, WV, and Trinity Corpeno of Lexington, NE; godparents, Steven Smith and fiancée Aimee Dion of St. James, MO; great godparents, Chris and Cathy Micheli of Rolla; a host of aunts and uncles and other extended family members. Trenton was preceded in death by his brother, Sawyer Valles; aunt, Isaura Magana; great aunt, Paula Wesley; and great uncle, Scott Parker. A funeral service for Trenton Valles will be held at 11 am Saturday, November 17, 2018 at the Null and Son Funeral Home in Rolla. Interment will follow in the Cedar Hill Cemetery in Edgar Springs, MO. A visitation for family and friends will be held prior to the service Sat. beginning at 10 am at the funeral home. Memorial contributions are suggested to the Beau’s Buddies Foundation, an infant loss support org. or to Trenton’s family. To send flowers or a remembrance gift to the family of Trenton Logan Valles, please visit our Tribute Store. "Email Address" would like to share the life celebration of Trenton Logan Valles. Click on the "link" to go to share a favorite memory or leave a condolence message for the family.